It's Not All About the Meat: Meat is a great source of protein but it's also a big source of saturated fat in many people's diets. So eat small amounts of lean meat, fish and poultry. 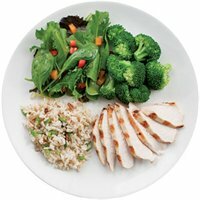 Fill up half your plate with healthy vegetables and fruits, a quarter of it with whole grains and the remaining quarter with your choice of lean protein.